Every year, my knit & crochet group has a little Christmas party where we have some sort of gift exchange. For several years we bought something new. Last year, it was gift from your stash. This year is different. It's going to be awesome. It works like this - everyone participating picks a yarn from their stash (between 350-600 yards), puts it in a brown paper bag with a tag inside that Laura was kind enough to make. The tag contains your name, your Rav name (for queue stalking) and shoe size (in case someone wants to make socks for you, they don't have to sneak around trying to figure out how big to make them). Everyone picks a random bag and makes sure they didn't get their own yarn, but doesn't reveal whose yarn they got. Then you knit or crochet the person something with that yarn. Our only rule is no bringing it to stitch night, because then you would reveal the secret of who you're knitting/crocheting for. The plan is to pick a day in late July/early August and have a little party and bring the finished gifts. It's going to be so fun! Someone told me about this sort of gift exchange when I was teaching at Vogue Knitting Live in October, and it seemed like such a fun and cool idea. The woman who told me about it is part of the Madison Knitting Guild and they do this, just on a much larger scale than our group of about 10. When I told my knit group about it, they were all so excited about the idea. 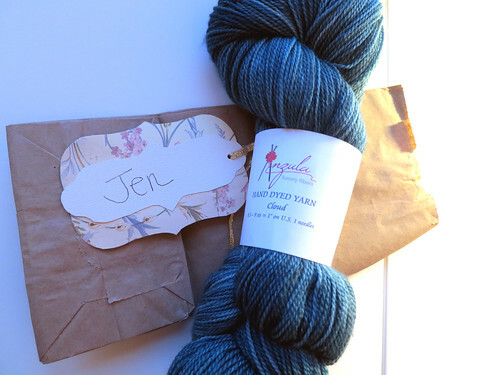 It's going to be so fun to see who ends up with my yarn and what she ends up making!